The 2013 Saint Paul Almanac. Cover art by Andy Singer. Following our September 13th, 2012 launch event, the Saint Paul Almanac Readings series takes place from September to November 2012, in coffee bars around the city, featuring writers who were published in the 2013 Saint Paul Almanac reading their poems and stories. Events are free and all ages. 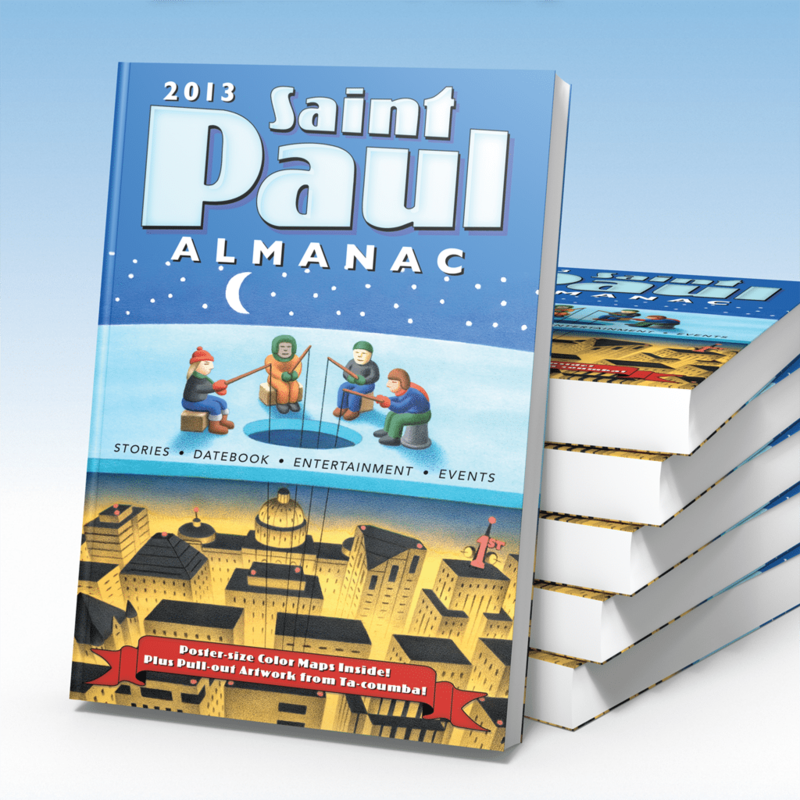 Copies of the new 2013 Saint Paul Almanac will be available for purchase at the readings. Monday, Sept. 24, 2012, 7:00 p.m.
Thursday, Sept. 27, 2012, 7:00 p.m.
Saturday, Sept. 29, 2012, 2:00 p.m.
Monday, Oct. 1, 2012, 6:30 p.m.
Saturday, Oct. 6, 2012, 1:00 p.m.
Monday, Oct. 8, 2012, 7:00 p.m.
Saturday, Oct. 13, 2012, 12:00 p.m.
Monday, Oct. 15, 2012, 7:00 p.m.
Friday, Oct. 19, 2012 7:00 p.m.
Monday, Oct. 22, 2012, 7:00 p.m.
Saturday, Nov. 3, 2012, 1:00 p.m.
Monday, Nov. 12, 2012, 7:00 p.m.
Monday, Nov. 19, 2012, 7:00 p.m.